ἐκ δὴ τῶν εἰρημένων ἡ πρώτη φύσις καὶ κυρίως λεγομένη ἐστὶν ἡ οὐσία ἡ τῶν ἐχόντων ἀρχὴν κινήσεως ἐν αὑτοῖς ᾗ αὐτά: ἡ γὰρ ὕλη τῷ ταύτης δεκτικὴ εἶναι λέγεται φύσις, καὶ αἱ γενέσεις καὶ τὸ φύεσθαι τῷ ἀπὸ ταύτης εἶναι κινήσεις. καὶ ἡ ἀρχὴ τῆς κινήσεως τῶν φύσει ὄντων αὕτη ἐστίν, ἐνυπάρχουσά πως ἢ δυνάμει ἢ ἐντελεχείᾳ. physis. φύσις. A transliteration, since (i) this is a fundamental philosophical principle/term that requires contextual interpretation, and (ii) the English words ‘nature’ and Nature not only do not adequately describe this principle but also lead to and have led to certain misunderstandings of Aristotle in particular and of classical Greek culture in general. quidditas. οὐσία. Quidditas – post-classical Latin, from whence the English word ‘quiddity’ – is more appropriate here than ‘essence’, given the metaphysical (ontological) context and given that ‘essence’ now has so many non-philosophical connotations. An interesting alternative would be the scholastic term haeceitty. As with physis, quidditas is a philosophical term which requires contextual interpretation. changement inherent. The expression ἀρχὴν κινήσεως is crucial to understanding what Aristotle means in respect of physis. In regard to κίνησις, since Aristotle here does not mean ‘motion’ or ‘movement’ in the sense of Newtonian physics (with its causal concepts of force, mass, velocity, kinetic energy), and since such physical movement is what the English words ‘motion’ and ‘movement’ now most usually denote, then alternatives must be found. Hence the translation ‘changement’. For what Aristotle is describing here is ‘change’, as for example in the natural development, the unfolding, the growth, of some-thing living that occurs because it is living; because it is possessed of Life and which Life is the ἀρχή of the changement, the ‘original being’ (the φύσις) from whence being-becomes to be often perceived and classified by us in orderly ways. What is described is an a-causal change, of being-becoming – of being unfolding – and thus fulfilling the potentiality of being within it. Hence why here Aristotle writes ἀρχὴν κινήσεως, which describes the potential changement inherent in certain beings. 1 That is, the a-causal origin of beings-becoming, or having become, and which beings (having changed, developed, unfolded) we then perceive and classify in orderly ways 2, such as by shape or usefulness to us, or by a notion such as causality: in terms of physical- ‘movement’. Which is why, in Aristotle, there is a relation between φύσις, μορφή, and εἶδος – εἶδος in the sense of ‘perceiveration’ and not, as in Plato, denoting an abstract ‘form’ or an ‘ideal’ – διὸ καὶ ὅσα φύσει ἔστιν ἢ γίγνεται, ἤδη ὑπάρχοντος ἐξ οὗ πέφυκε γίγνεσθαι ἢ εἶναι, οὔπω φαμὲν τὴν φύσιν ἔχειν ἐὰν μὴ ἔχῃ τὸ εἶδος καὶ τὴν μορφήν. substantia. ὕλη. I have chosen to use the etymon of the English word ‘substance’ – qv. substantia in Thomas Aquinas, Sententia libri Metaphysicae – to again (i) emphasize the need for contextual interpretation in respect of a specific philosophical term, and (ii) to avoid whatever misunderstandings may arise from the modern (non-ontological) connotations of words such as ‘matter’ and ‘substance’. as have the becoming that is a coming-into-being, and a burgeoning, because they are changements predicated on it. καὶ αἱ γενέσεις καὶ τὸ φύεσθαι τῷ ἀπὸ ταύτης εἶναι κινήσεις. The sense of γένεσις here implies a ‘coming-into-being’ rather than just ‘generation’, just as φύω implies a being ‘burgeoning’ – unfolding, revealing itself (its physis) – rather than just ‘growing’. the potentiality of a being or as what a being, complete of itself, is. The Greek word ἐντελεχείᾳ is compounded from ἐν ελει ἔχει and the sense here – in relation to ἐνυπάρχουσά – seems to be twofold: of a being as an unchanged being, and of what a being has become (or is becoming) as a result of a change, for both types of being actually exist, are real. One exists as a being as it is and has remained, and one exists as the being it has become (or is in the process of becoming) through the potential for changement inherent within it. Thus, for Aristotle, physis denotes the being of both types of being. In respect of ἀρχὴ as implying what is primarily inherent, qv. 1012b-1013a. As Thomas Aquinas wrote: “Sciendum est autem, quod principium et causa licet sint idem subiecto, differunt tamen ratione. Nam hoc nomen principium ordinem quemdam importat; hoc vero nomen causa, importat influxum quemdam ad esse causati.” Sententia libri Metaphysicae, liber 5, lectio 1, n 3. Regarding 1078a, τοῦ δὲ καλοῦ μέγιστα εἴδη τάξις καὶ συμμετρία καὶ τὸ ὡρισμένον (the most noticeable expressions of kalos are schemata and harmony and consonancy), my view – given the context – is that τάξις here is best translated as “schemata”, rather than “order” or “arrangement” both of which are vague, open to mis-interpretation, and unrelated to the context, which context is mathematical beauty. Similarly, ὁρίζω (to me) suggests consonancy, echoing as that (now somewhat obscure) English word does both by its use by, among others, Shakespeare (Hamlet, Act 2, Scene 2, 286) and also by its relation to the almost ‘mathematical beauty’ of some music (as evident for example in the counterpoint of JS Bach). Furthermore, just because the Greek has συμμετρία it does not necessarily follow that the English word ‘symmetry’ is an appropriate translation, considering how the word symmetry is now used and has been used, in the West for many centuries, and especially in relation to art (in terms, for example, of objects and the human body). 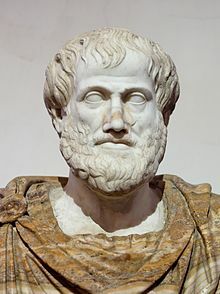 Given that Aristotle in 1078a is referring to geometry in particular and mathematics in general, then an appropriate translation is ‘harmony’ – as in “a collation of representative signs or marks, so arranged that they exhibit their agreement and account for their discrepancies or errors.” A harmony, in other words, that is most evident (as I mentioned in my essay) in Euclid’s Elements, as schemata and consonancy are therein evident, most of the contents (theorems) of which book – deriving from people such as Pythagoras – were known to Aristotle. Thus, a translation such as “the chief forms of beauty are order and symmetry and definiteness” can in my opinion lead to projecting onto Aristotle what he may not necessarily have meant; and projecting onto in respect of how we now, over two thousand years after Aristotle, understand and use such common English terms. Hence, also, why I sometimes use obscure English words (which may suggest a relevant meaning) or transliterations (as in physis).